Explore the glacial waterways deep in the Southern Hemisphere! 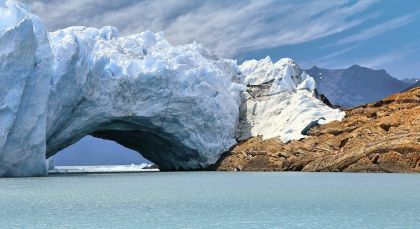 On this Argentina and Antarctica tour, discover iconic, snow covered landscapes such as the Perito Moreno glacier and Ushuaia, the end of the world! In Antarctica, lose yourself in the haunting beauty of a timeless land, replete with open seas, towering peaks, vast deserts and unique wildlife. Breathe in the fresh air and relish the tranquility of this remote corner of Patagonia as you choose daily from included activities such as trekking, mountain biking, bird watching or star gazing by telescope. For more detailed information on all the activities offered by the Eolo Hotel please visit their website. Day 3: Following breakfast, check out Ushuaia’s outskirts, or unwind at the resort until your mid-afternoon transfer to the ship. Ushered in by your expedition team and crew onboard, check in to your boutique accommodations and settle in. After a safety briefing and orientation session, meet with fellow passengers over the Captain’s welcome dinner. 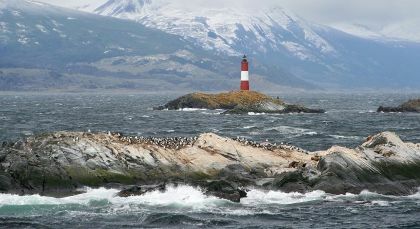 Take in the panoramic vistas around, as you sail through the scenic Beagle Channel, past the world’s most southerly town of Puerto Williams, and colonies of penguins, cormorants, and sea lions. After an overnight journey, wake up to the legendary surrounds of Cape Horn. As one of the privileged adventurers to set foot on the island, get a unique ‘Isla Hornos’ passport stamp as your souvenir. Day 4 – 5: Over the next couple of days southbound, navigate the Antarctic Convergence and the famous Drake Passage. Learn about Antarctica’s fascinating history, flora, and fauna during interactive presentations and engaging lectures courtesy of passionate polar naturalists. Along the way, be part of the expedition’s research by filling out sea bird sighting surveys, assist in the collection of salinity samples, and help record weather data. As you look out to the open waters from the observation lounge and outdoor decks, keep your fingers crossed for rare sightings of whales breaching. During mealtimes, savor gourmet spreads complemented by periodic entertainment. On the way, you will notice the pleasant change of scenery with icebergs and the Antarctic mainland showing up on the horizon. Day 6: Traversing the beautiful ice-filled bays of the South Shetland Islands, you could make stops at penguin rookeries, seal wallows, bird colonies and whale feeding areas, as well as numerous historic sites and colorful research station settlements. You may also visit Half Moon Island and the picturesque Deception Island enroute. 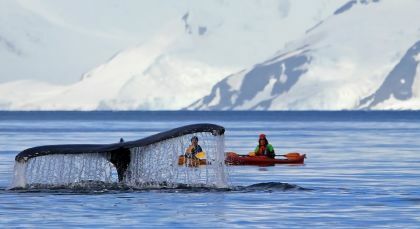 Day 7 – 9: As you continue south of the Gerlache Strait along Antarctica’s western fringes, expect to encounter myriad species of penguins, seals, and whales, all thriving in their natural habitat. Drop by Neko Harbour and Paradise Harbour to see spectacular groups of glaciated mountains and calving icebergs. Marvel at the stunning beauty of Lemaire Channel and Neumayer Channel both flanked by snow-covered landscapes of the surrounding archipelago. Visit the living museum of Port Lockroy – a former British research station set against towering mountain ridges. You can send postcards to loved ones from the world’s most southerly post office located here, and also browse souvenirs at the gift shop. Heading further south, through the wildlife-filled Penola Strait to Vernadsky Research Base, get ready to do house-distilled vodka shots at Faraday Bar, the southernmost drinking hole in the world! Day 10 – 11: After waving goodbye to Antarctica, spend the next two days aboard the ship at leisure, as you make your way back to South America. Enhance your understanding of the Antarctic region with Q&A sessions to help you relive your own firsthand experiences. This final leg of the journey takes you through the Beagle Channel between Tierra del Fuego and Navarino Island. Day 12: Arrive in Ushuaia and bid farewell to your new friends! 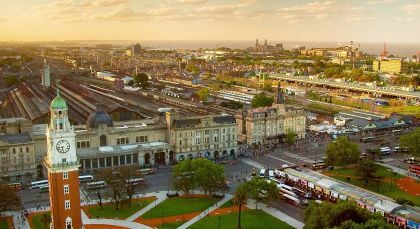 Accommodation in one double room for 16 days / 15 nights.